Our range of bottleless standard coolers offer a way to get chilled, clean and filtered water from a mains water supply. Our engineers will come and install the coolers and 6 monthly sanitisation are available for £75. For your £75 you get a visit from one of our engineers who will fit a new filter, sanitise your cooler and clean everything up leaving you with a perfect clean and healthy cooler. Home Water coolers is a sister company of The Water Delivery Company and The Water Cooler Company, all rental contracts for bottleless coolers taken out will be with The Water Cooler Company. The Borg water cooler is a high capacity mains-fed water cooler available in silver or graphite finishes. The Borg bottleless water cooler is available in floorstanding or countertop models and can be rented from £5.25 per week – dependent on contract length. Available in ‘room temperature and cold’ or ‘hot and cold’ (with child safety taps). 3 litre cold tank – Up to 12 litres of chilled water per hour. 2 litre hot tank – Up to 6 litres of hot water per hour. 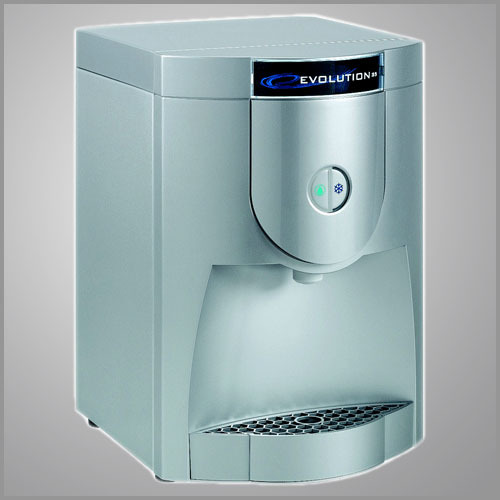 The Evolution bottleless water cooler is high capacity mains-fed water cooler available in floor standing or counter top with a metal-effect casing. 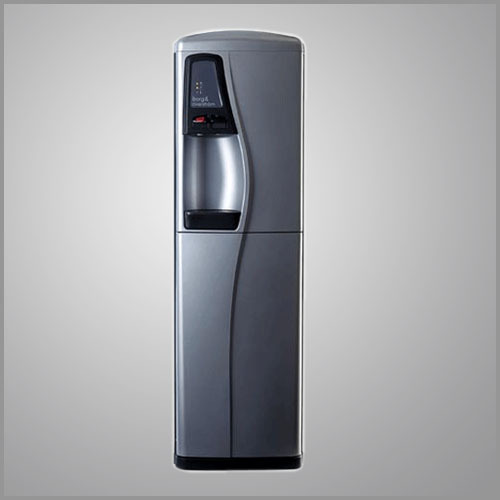 This mains-fed water cooler can be rented from £5.50 per week – dependent on contract length. Typically taller than many other bottleless water coolers, this British designed water cooler has a higher dispensing point than any others we offer. Anti-microbiological Hygiene Guard Technology around the dispensing point inhibits bacterial growth. Furthermore the Evolution bottleless water cooler also features two integrated cup dispensers capable of holding a total of 200 plastic cups. It is available in ‘room temperature and cold’ or ‘hot and cold’ (with child safety taps). This plumbed-in water cooler has a compressor within the water cooler. This means that it has a high capacity for both chilling the water quickly. 2.5 litre cold tank – Up to 3.5 litres per hour. 1.5 litre hot tank – Up to 4.5 litres per hour. We also offer the Borg cooler for purchase, the Borg counter-top and evolution are available on a rental contract only. Please note the prices do not include VAT which is added when you pay. Installation Kits – Customers who wish to install the water cooler themselves may also wish to purchase a WRAS approved soft or hard plumbing kit from us. Installation Service – If you would prefer us to arrange for installation anywhere in the UK please call us and we can arrange from £95 ex VAT. Maintenance Contracts – We offer our Total Cooler Care™ range of service packages for customers who own bottleless water coolers. This ranges from a next day callout service, to six monthly sanitisation through to a fully comprehensive package.